There have been prestigious labels and comparisons thrown around regarding the continued development of Giannis Antetokounmpo this season. Improved shooter, isn't one of them - yet - especially if we're going by percentages from behind the arc, as Giannis has made just 11 of his 43 (25.5%) of his 3-point attempts. At just 22-years old, Antetokounmpo is still gaining comfort with NBA range 3-pointers. He's attempting 2.3 threes per game, the highest mark of his NBA career thus far, after hitting 5 of 15 attempts in three games with the Greek national team this past summer. Still - in spite of his current meager 3-point percentage - there is reason for Bucks fans (and Antetokounmpo fans in general) to believe he can become a better shooter with time, experience and instruction. After all, his free throw percentage has increased from 68.3% in his rookie season to 77.9% this season, while making a career-high 5.4 free throws per game. If Giannis, a career 158/545 (29%) shooter from behind the arc in 344 games logged in our database (through all competitions he's played in), is going to improve it's going to take time. Here's a video interview with Antetokounmpo that focuses on his development as a shooter during his fourth campaign with the Milwaukee Bucks. One year ago, we discovered Giannis Antetokounmpo in a tiny gym in Athens, and were immediately taken aback by the significant talent this completely unknown raw prospect possessed. The son of Nigerian immigrants, Antetokounmpo (then known as Adetokunbo) was a citizenship-less 18-year old caught in the bureaucracy of Greek politics, known only to a handful of NBA scouts who were largely skeptical of the anonymous player's potential. 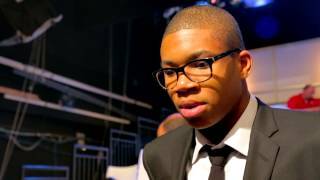 Completely off the radar of anyone in the United States at the time, Giannis would go on to be selected 15th overall by the Milwaukee Bucks, a move that was criticized harshly by some on draft night. Fast forward one year, and Giannis is now viewed as one of the most promising young prospects in the NBA, after unexpectedly seeing significant playing time for the team with the worst record in the league. He will compete in the NBA's Rising Stars Event (formerly known as the Rookie-Sophomore game) and the Skills Challenge at All-Star weekend in the upcoming days. To celebrate our one year anniversary of seeing the Greek Freek for the first time, we revisit some of the footage we first brought to light from the Greek second division a year ago, and compare it with what we're now seeing in the NBA on a nightly basis to evaluate how Giannis is progressing as a basketball player. Taking a short trip to Jesolo with a hoard of NBA scouts (probably around 50), we were able to take in a U20 game between Croatia and Greece featuring highly touted Greek small forward Giannis Adetokunbo (name has sicne been changed to Giannis Antetokounmpo), playing in his first ever game outside of Greece after finally obtaining his passport (he in fact now has two after also receiving a Nigerian passport). Starting at the power forward spot but regularly bringing the ball up the floor, he turned in a solid, albeit unspectacular performance, finishing with 11 points, 6 rebounds, and 4 assists by our count while putting many of his strengths and weaknesses on display for those in attendance. Acting as a facilitator for his team in the half court and making a number of impressive plays in the open floor, Adetokunbo didn't look out of place competing with players one year his senior in most cases, but his lack of experience was evident. He had a number of rebounds ripped away from him, didn't always finish strong around the basket, and airballed a 3-pointer on one occasion--but later smoothly knocked down another. Directing his teammates as Greece ran its sets, Adetokunbo has a unique feel for the game considering his age and athleticism, and is undoubtedly a special talent, but is definitely still in the early stages of his development. All in all Giannis probably didn't impact his draft stock significantly in either direction. People who liked him probably saw what they needed to see, while those that didn't surely weren't swayed by what he showed. A fairly substantial contingent of the 50 or so NBA scouts started to file out with 6-8 minutes left in the fourth quarter, which can't be considered a great sign. The stop and start nature of the game and overall poor officiating surely didn't help matters, but Adetokunbo will need to show more in the next two days if he wants to definitively boost his stock into the top-20.